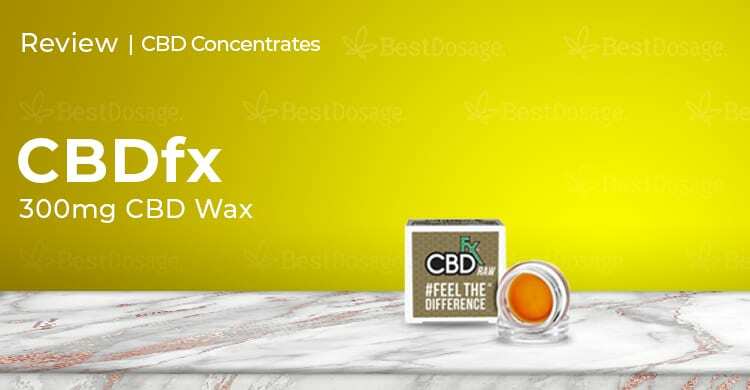 CBDfx Wax 300mg Review: First Impression, Dosage, Effect and more.. Overall, given the effect, portability, and quality, it makes for an appealing CBD product option. If you haven’t tried dabbing, you really should. It’s really a different experience that everyone should at least try once. The CBDfx CBD wax and mini wax pen make for a great place to start. Dabbing has become incredibly popular, and here comes the CBDfx CBD wax to allow for their own CBD dabbing. CBDfx has been very successful in almost all forms of CBD, but can they conquer wax too? Let’s find out. CBDfx offers a wide range of products. Their roots are in vaping, but they’ve quickly branched out to create other high-quality CBD products, like gummies, vape pens, and now even with CBD wax. CBDfx has been around since 2015 and is known for being a brand that is serious about their products’ quality as well as their customer service. The CBDfx CBD wax is a concentrated form of full spectrum CBD. It’s made with full spectrum CBD oil that is extracted from organically grown, Non-GMO, CBD rich hemp. The CBD oil, which also naturally enriched with terpenes and amino acids, is then concentrated down to wax form to allow for dabbing. Overall it contains one gram of 30% CBD oil, which translates into 300mg of CBD. It’s hard to initially get over just how small the CBDfx CBD wax is. If you’re new to wax, it’s almost hard to comprehend how 300mg of CBD can be contained in such a small form. The wax itself is in a tiny container which makes it incredibly portable. It’s a got an amber-gold hue to it that is pretty in its own right. Taking a small amount, about the size of a grain of rice as is recommended, we instantly noticed how gooey it was. For the few people on our team who are experienced CBD wax users, it was softer than they were expecting. With those observations behind us, it was time to dab. The company recommends taking a small, rice grain sized, dab of CBDfx CBD wax and placing that directly on the coil to be heated and vaporized. A rice grain sized piece of wax, in this case, is good for about 15mg of CBD. For someone used to dabbing, this might not be enough. Yet you shouldn’t try more at first if you’re new to it, as dabbing is an incredibly fast and powerful way to dose. You can always go for a second dab as needed. This CBD wax can also be taken sublingually. Simply place a rice grain sized piece of it under your tongue for 90 seconds, and then swallow what’s left. You’ll need to dab this CBD wax by putting on some kind of device to heat it. It could be a bigger rig, that is traditionally used by people trying to get really high from THC, or as simple as a small CBD wax pen. CBDfx has a mini CBD wax pen that is made just for this purpose and is super portable. After dabbing with the said CBDfx CBD wax pen, everyone felt an immediate rush. It wasn’t a THC high at all, but the effects of the full spectrum CBD oil kicked in instantaneously. If you think vaping is fast acting, dabbing is even more so. Anxiety seemed to melt away as soon as we were finished dabbing. Some of us used it at the end of the night and it put us in a bed-ready state immediately, ready for a great night’s sleep. Those using it for pain were surprised just how much it affected them from only 15mg, but those with acute pain went for a second dab rather quickly. One veteran CBD wax user did complain that it wouldn’t work well on more professional dabbing equipment because it was too soft in consistency, so beware of that possible flaw. This is a quality brand as such, you would expect great customer support. They certainly deliver and give you a variety of contact options too. Whether it is email, live chat, or their toll-free number, you’ll get a quick response and their staff is always super helpful. An extra tip? Try writing them on Instagram! They’ll get back to you just as quickly and you can do it right from your app. Free shipping on all orders in the USA – can’t beat that! You can also track your package directly with CBDfx, so you can keep tabs as that tiny container of CBD wax makes its way to you. CBDfx CBD wax, in tandem with the CBDfx mini wax pen, makes for an easy entry into dabbing. The wax is packed with CBD, and dabbing it instantly provides relief. It may be that CBDfx is gearing this for newer CBD wax users, as veterans did take some issue with the consistency. Most of us liked the flavor and found it subtle, but not everyone did.